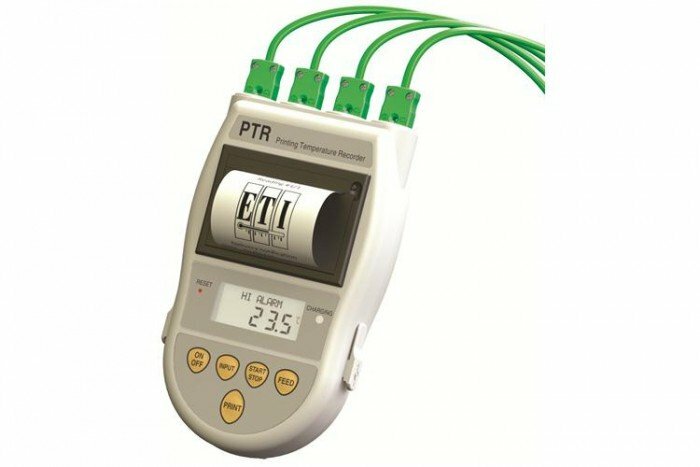 The Printing Temperature Recorder, printing thermometer from ETI has been designed specifically to provide a cost effective means of automatically measure and recording temperature and time at regular preset intervals. With the ability to log temperatures unsupervised through the night, weekend and during the normal working day, the printing thermometer helps save time and money. Housed in a robust ABS case, the device has print functions which can be easily operated using the built in keypad and can provide a printed record of temperature measurements in real time. This temperature recorder with printer features an easy to read, LCD display which has a low battery indication and shows temperature over the range of -200 to 299.9 °C with a 0.1 °C resolution or 300 to 1372 °C with a 1 °C resolution. Using the compatible software provided, the user can programme high and low alarms for each of the four input channels; each channel can also be personalised with its own label (maximum 12 characters), i.e. machine 1, machine 2, etc. The software also gives the user the option to personalise printed tickets with a company name, address and logo. At the end of each day or week, an audit trail can downloaded from the printing thermometer, this can be downloaded in either comma separated (.csv) or Excel (.xls) format. Note: probe not included, must be purchased separately.